10 December 2008, at 4:17a.m. US - Cellulose is a key component of plant cell walls that can be converted into ethanol and other products. New findings from the Agricultural Research Service (ARS) could help make that conversion process easier. Plant walls contain cellulose, the main component of paper and a source of sugars for ethanol production. Cellulose could be described as the "brick" of the cell wall, while pectin, hemicellulose and lignin function like mortar, cementing everything together. 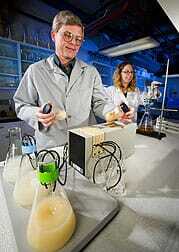 Lignin is vital for plant survival, but its structure impedes cellulose conversion. But what if lignin were altered so that it would break down easier, thus facilitating the production of paper, ethanol and other industrial products? That's the goal of ARS scientists at the U.S. Dairy Forage Research Center in Madison, Wis. There, research agronomist John Grabber--working with ARS plant physiologist Ronald Hatfield, Fachuang Lu of the University of Wisconsin, and John Ralph, formerly with ARS and now at the University of Wisconsin--has designed lignin that breaks down more easily. Grabber and his colleagues first tested the effects of changing the cell walls in a laboratory--before applying those changes to live plants--by incorporating a chemical compound called coniferyl ferulate into lignin formed within cell walls. First, they synthesized the compound in the lab and added it to cell walls isolated from corn. Then they subjected the cell walls to alkaline treatments, which are commonly used to degrade lignin. The altered lignin broke down more readily than conventional lignin under mild alkaline conditions, demonstrating the potential for this modification to facilitate cellulose use. Further research showed that incorporating other molecules such as feruloyl and caffeoylquinic acid into lignin could also enhance cellulose utilization. Hatfield, Ralph and ARS geneticist Jane Marita at Madison are now leading efforts to engineer plants to make lignin with coniferyl ferulate. This work has potential benefits not just for paper and ethanol production, but also for livestock production. Modified lignin could make fibrous crops more digestible, allowing producers to feed more forage crops and less grain to their livestock.